The 7th Annual Expect Miracles Wine & Spirits Charity Event was a truly memorable evening and was recognized by attendees as one of the best in the Expect Miracles event program to date! Prominent members from the financial community came together on November 4th where an exquisite evening was in store, all in support of MFAC and its mission to find a cure. Guests were given the tremendous opportunity to taste and savor over 40 wines from 10 countries around the globe, graciously donated by M.S. Walker. Two food and wine pairing lounges, one representing our own New England and the other the bistros of France, allowed the guests' pallets to be treated to food and wine medleys. Throughout the event, guests participated in an opportunity drawing for chance to win one of three fabulous prizes: a trip to the ESPY Awards in LA, a private catered dinner for 10, and a choice of one of two exclusive Suzanne Dines necklaces. A live auction also allowed guests the opportunity to walk away with a Corporate Suite for 12 to a Bruins game, a Patriot's Fan Package, or a Napa Valley Wine trip. The new organizational logo lit up the room as guests applauded in support of the non-profit's new direction. Dr. DePinho, Director at the Center for Applied Cancer Sciences (CACS) at Dana-Farber, made a special appearance as well and addressed attendees at the Foundation Reception, and his passionate address only further cemented that CACS is the right cause for us to be supporting. 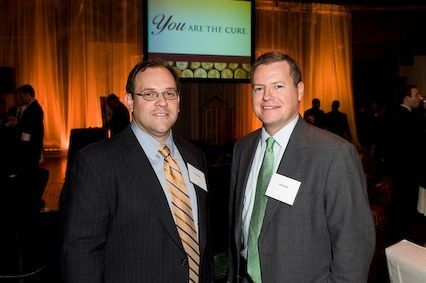 YOU are the cure and together we were able to raise over $120,000! As always we are so grateful for our generous sponsors, attendees, and volunteers for building such a successful and noteworthy evening.